Silas K Hocking, born in 1850, was a Cornishman, a Methodist minister and a writer. I was drawn in immediately, curious to know what might happen to such a promising heroine. And I found a story that reflected all that its author was. 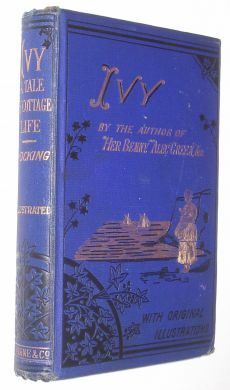 Ivy lived in a small cottage, set outside a small Cornish fishing village, with her father and her two brothers. A family without a mother; she had died giving birth to her younger son, and the three who were left to mourn her all responded to their loss in different ways. James, her husband, withdrew from the world. He was a good man, a fisherman who had earned a share in his boat, and he worked hard to support his family, but he was a shadow of his former self: a man marking time until he might attain his dearest wish of being reunited with his beloved wife in a better world. Fred, his elder son, became selfish, forgetting that others cared about him and that others had suffered too. He became feckless, doing exactly what he wanted with no thought for anyone else, no thought for the consequences. Ivy reached out to others, caring for her family, looking after the house, caring for her frail younger brother, Ned, and trusting that God was watching over her family. An interesting study of grief. It was clear from the beginning that this would be a very moral and rather sentimental tale. I didn’t mind: I couldn’t argue with the author’s moral stance, and sometimes a little, well-placed sentimentality is a very good thing. Besides, I was in the hands of a very capable storyteller – I had to know what would happen! God had more trials in store for Ivy. Her father’s fishing boat came back into port without him. The waters had been calm, nothing had been seen or heard, and yet he had vanished without trace. Ivy was distraught, but she believed in her heart that her mother had called her father back to her side. She looked to Fred for help, but he gave her nothing. He took all of the money that their father had saved and set off for London, in the firm belief that he was destined to become a gentleman of leisure. That left Ivy in a terrible position. She couldn’t leave her beloved Ned to go to work. But she had to find money somehow to pay the rent. She knew that if she didn’t her landlord, Mr Jeremiah Swift, would take the cottage back and she and Ned would be separated and sent to the workhouse. Captain Jack, the owner of her father’s boat, tried to help, but there was little he could do and he feared compromising Ivy’s reputation. Ivy’s fortunes rose and fell, and in the end it became too much for her. She fell ill, she lost Ned, and she very nearly despaired. I certainly despaired for her. But she hung on to her faith and in the end she found a new path in life. She brought Mr Swift around to a new way of thinking, she gave something wonderful to Uncle Jeff, the wise man of her village who had offered her counsel and support, and she helped Fred when he finally saw the error of his ways and wanted to turn his life around. At this stage, the voice of morality that I had rather liked began to preach. I liked that rather less, but I had to see the story through and things did seem to be working out rather nicely. It was a little predictable, but sometimes, in an uncertain world, I like that. In the end, of course, Ivy had her own, old-fashioned happy ending. Glad you’ve discovered him. He can be a bit of a moralist but he tells a good story. I have a problem with Victorian sentimentality and moralising, which is why I loathe most of Gaskell and all of Dickens. (I know! I’m in the minority with that.) Still, it sounds as though Hocking was a good storyteller and I’m glad you enjoyed the book. I really like the sound of this and am not adverse to a bit of sentimentality and moralising which is good for this book 🙂 I’ve not heard of Silas Hocking before, but will certainly keep his name in mind when I am book hunting. Thanks for sharing! when I was nine-years-old and evacuated to a home without a bookshelf, I found a Silas Hocking book in a cupboard and read it through in no time. It was about a travelling preacher and I thought it was the best thing ever written. Glad you enjoyed this author : I have never read anything else of his but, gosh, the impression made on me as a child !